Major League Baseball Clubs will wear an MLB 150 patch on the right sleeve of their jerseys for the entire season in celebration of the 150th anniversary of the first openly all-salaried professional baseball team - the 1869 Cincinnati Red Stockings. All MLB Clubs will feature an MLB 150 patch on caps on Opening Day, March 28. 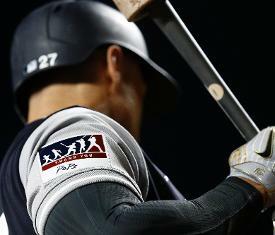 This recognition reflects previous MLB tributes that featured special patches worn all season by clubs in 1969 (100th anniversary) and 1994 (125th anniversary). This will be the first time an MLB league-wide anniversary recognition will be featured on caps. Throughout the season, MLB will create original content to pay tribute to its history while connecting it to the players and game today. The season-long recognition will extend across MLB media including MLB Network, MLB.com and MLB Social Media platforms. "We're excited to recognize the 150th anniversary of professional baseball by honoring our history while celebrating the game and the great players of today," said Baseball Commissioner Robert D. Manfred, Jr. "The MLB 150 patch will be a continuous reminder on the field of the link everyone involved in the game today has with the storied history of professional baseball and MLB." MLB will support Cincinnati Reds activities and promotions as the Club celebrates the anniversary with 15 throwback uniforms worn throughout the season and a special commemorative logo that they will wear on caps and jerseys in lieu of the MLB 150 patch. MLB also will support Reds special events including Commissioner Manfred serving as the grand marshal of the 100th Findlay Market Opening Day Parade in Cincinnati. As the first openly all-salaried professional team in baseball history, the 1869 Cincinnati Red Stockings recorded a perfect 57-0 record.